The new season of the Call of Duty World League, featuring Call of Duty: Infinite Warfare, will get underway with the first live event scheduled for 16-18 December at the Mandalay Bay in Las Vegas. Teams from all over the United States will compete for their chance to take home the first event title of the new CWL season and the winner’s share of the $100,000 prize pool (£82,000). In its inaugural season, the Call of Duty World League saw more than 1,000 teams compete, with the 32 top teams from around the globe making it to the World Championship hosted at Call of Duty XP, where Team EnVyUs was crowned champion in a thrilling final against the top European team Splyce. Throughout the year fans watched more than 1.1 billion minutes of broadcast content with more than 100 million views. 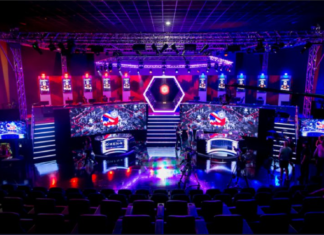 With next month’s launch of Call of Duty: Infinite Warfare, the stage is set for a new year of exciting competition as teams from the around the world compete for the ultimate prize, of being crowned CWL champion. Rob Kostich, General Manager and Executive Vice President of Call of Duty, Activision said: “The debut season of the CWL was a massive success, huge thanks to the Call of Duty community and our partners for their support. Congratulations to Team EnVyUs and all the talented teams who competed. But come December, a new season starts and what better place to kick things off than in Las Vegas. Fans unable to make it to Vegas will have a range of viewing options including in-game (Infinite Warfare PS4) on the Live Event Viewer, MLG.TV, Twitch, and YouTube. There’ll be more information about the upcoming CWL season with more Infinite Warfare esports features to be presented, via livestream, on Wednesday 26th October . Tune in to MLG.TV or www.twitch.tv/CallofDuty at 10pm GMT. Esports Insider says: Call of Duty World League is back, and with Infinite Warfare reportedly very much geared towards becoming a major player in esports this could be a big season for COD.